Shalom, Boys and Girls, and Happy Hanukkah! Once again, it’s time to get out the dreidels and menorahs! Starting tomorrow night at sunset, the first night of Hanukkah begins! Eight days and nights follow to observe this traditional Hebrew holiday until nightfall on December 5. Because of the time of season it falls on, Hanukkah is sometimes considered a sort of Jewish Christmas, but what exactly is this celebration about? Let’s take a deeper look. First of all, as opposed to Christmas (which is a steady Dec. 25), Hanukkah goes off of a lunisolar calendar which is based on the sun and the moon while the traditional Gregorian calendar only considers the sun and the time it takes the earth to move around it. Hanukkah consistently begins on the 25 of Kislev, a month of the Hebrew calendar. 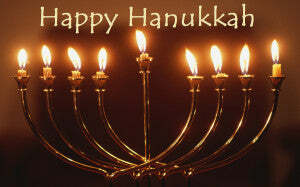 The history of Hanukkah goes back to 165 B.C. when a Jewish rebel army known as the Maccabees defeated the Syrians and rededicated their holy temple in Jerusalem. The eight days of Hanukkah are about a seven-day miracle in which the Maccabees only had enough oil to light the temple’s eternal flame for a single day, yet the lamp kept on burning for eight! Onto Hanukkah’s main tradition, the lighting of a distinctive, nine-branched candleholder which is often times referred to as a menorah (like in the second sentence of this post). Not everyone knows that this name is actually incorrect for the traditional nine-branched candelabrum. It’s actually called a Hanukkiah. A menorah, on the other hand, has only seven candleholders—like the lamp that was used in the ancient holy temple in Jerusalem. Hanukkiahs have nine candleholders so that there’s a candle for every night of Hanukkah and then one more to light the others. If you celebrate Hanukkah, you now can educate your friends and family on the holiday you’re about to celebrate! Happy Hanukkah.